Enter the maptastic Eric Fischer and his Locals And Tourists: visualizations of each of the most-photographed cities in the world that pinpoint where visitors – and residents – tend to take pictures. 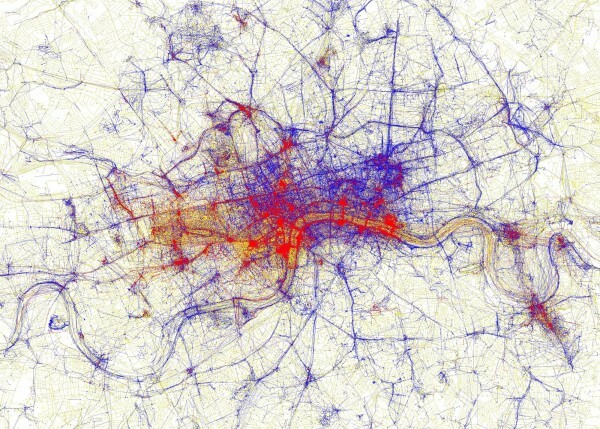 Above is his London, showing that tourists (red) concentrate near the River Thames and West End attractions and locals (blue) along the arterials of the lesser-known neighborhoods. Data geeks will appreciate the underlying process, wherein Eric harvested the metadata from millions of geotagged online photographs, linked together those taken by the same photographer at about the same time, and then plotted them over the Open Street Map grid. The coloring, red for tourists and blue for locals, comes from a simple-yet-elegant heuristic: that a photographer lives near where they snap shots month in and month out. Pure genius! See the full set, in all its high-resolution glory, on Eric’s flickr.